Prisoner’s Dilemma: Between the Greeks and Their Creditors, Who is Doing Less to Solve the Crisis? 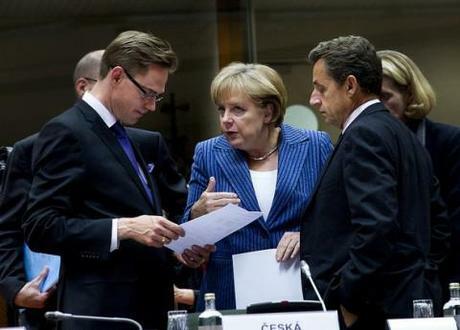 The endless negotiations for the second great Greek bailout seem at last to be nearing their conclusion. On Sunday, the country’s parliament must vote in a new round of austerity measures in order to receive a new € 130 billion package, and, for the funds to be available by mid March (when Greece must repay a bond tranche), we are told that there can be no more delays. However, as one firm deadline after another has passed with no deal between the coalition government and the Troika of EU, ECB and IMF, or between all these parties and private sector creditors, we must ask who is dragging their feet more? A firm deal would surely be a victory, so why does it increasingly feel like there will be no winners, but only different degrees of losers? Of all the participants in this drama, who is merely in a very difficult position, and who is in an impossible one? The situation is very complex and very fluid but, for simplicity’s sake can be seen as a chain, with some links less flexible than the others. The inflexible links start with the IMF at the top of the chain. With little to lose, the IMF demands austerity without any compromise as a condition for emergency loans, and that its loans be repaid ahead of all others. Below the IMF are the EU and the ECB. They have much more at stake in terms of prestige and possible contagion. On the other hand, the individual leaders of the EU are voted in by national electorates who have little interest in saving Greece. It seems that the people of the wealthier European countries draw the line at bailing out their poorer neighbours. The ECB also seems unwilling (officially at least) to countenance taking a loss. European leaders are uncertain whether to bail Greece out or kick her out. In an even weaker position are the private sector creditors. They know that they will be paid last, so are interested in reaching a deal . . . all except those who, using credit default swaps, have taken a bet on a Greek default, and are therefore trying to force one. The next link in the chain is the Greek political establishment. They are desperate for a deal, but are powerless to implement the kind of “Carthaginian peace” that the Troika are demanding. Whether these measures are actually making the situation worse is entirely beside the point. Caught between merciless creditors and accusations of ceding Greek sovereignty to foreigners and oppressing their own people, they make the Troika promises, promise the people something else, and hope to remain in power. Unfortunately, the more unpopular each party gets, the more desperate its MPs become to gather support by resorting to populist rhetoric and grand gestures of defiance against the “foreign bloodsuckers.” Next come the hardline left parties and the unions. Now the links become more inflexible again. The hard left bases its whole strategy on the psychology of fear . . . “support us and we will get you job security and generous benefits, and protect them from those who seek to take them away from you.” If austerity and privatisations are taken too far, their powerlessness will have been exposed. Far better to default, blame the mainstream politicians, and exploit the fear and misery that a default creates. The irony is that the unions can claim to be defending the rights of the people, when in fact it is labor militancy that has been the primary cause of the vast unemployment among the young, poverty among the very old, and the giant government deficit. The final link at the bottom of the chain are the Greek people. On one hand, they overwhelmingly wish to remain part of Europe. On the other, they have seen their economy destroyed, their incomes shrink, and their taxes rise. They are variously told that this is the fault of foreign profiteers, Angela Merkel and the German people, the IMF, or their own fault for being tax dodgers and a drain on the public purse. They don’t really know what to think, but actually, what they think doesn’t really matter. By the time the elections come round, the issue will have long been decided one way or another.